Mustard is a preserved vegetable-based food product whose main ingredients are mustard seeds and vinegar. In Europe mustard has been known since the time of the Romans, who knew about its antioxidant properties and used it for many purposes including preserving fruits, vegetables, and even grape must, from which derives the French term for mustard “moutarde,” which was used for the first time in a French text in 1288 in reference to spicy, "fiery grape must." 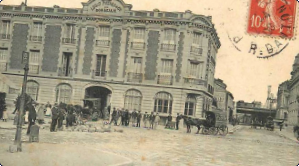 France, which was introduced to mustard by the Romans, who imported it to Gaul, possesses a great gastronomic tradition linked to mustard (a gourmet chronicler of the 19th century lists 93 different "moutardes"), whose traditional place of origin is considered to be Burgundy, which even today is considered to be one of the main regions for the production and consumption of this condiment. 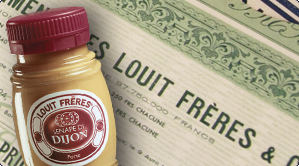 Since the distinctive aroma of mustard is volatile after opening the jar, it is best to avoid containers that are too large. 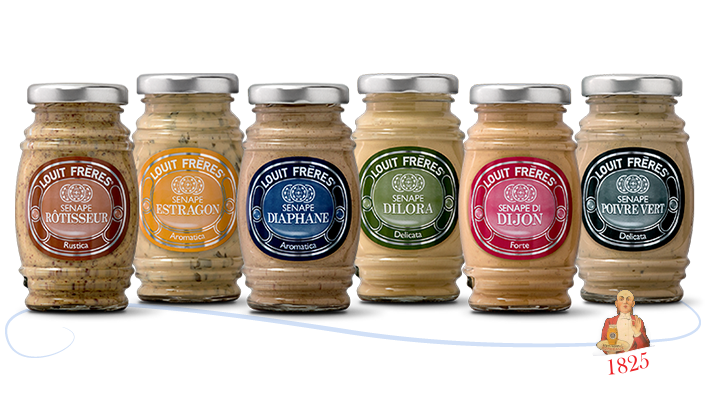 This is why the 6 types of Louit Frères mustard that are produced today are packed in characteristic 130-gram barrel-shaped jars.